Autism and the Art of Communication: Drawing to Communicate: making sure your message is received! Drawing to Communicate: making sure your message is received! This morning I received the kind of message that totally recharges my "therapist batteries". "We were chatting about having an outing ... either to Carp Market or the beach at Fitzroy Harbour Provincial Park. Kieran was in the room when we were talking and said that he wanted to go to the beach. 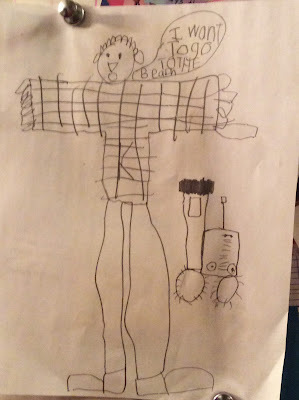 We acknowledged his input, but I think he wanted to make really sure that we understood - he got a piece of paper and a pencil and drew this for us!" Yay, triple yay for Kieran! He used his new drawing communication skills to make sure that his important message was received by his family (who were happy to accommodate his wishes in the family schedule for the day). Being able to clearly communicate your thoughts and wishes to others (who will listen to and respect that communication) is the strongest strategy for short-circuiting difficult behaviour and melt-downs - knowing that you're "heard" makes all the difference.